After a long wait for more than a month, the skies finally opened up over Bathinda and its adjoining areas on Wednesday evening. While neighbouring Mansa has been facing a flood-like situation for the past two days, clouds played hide and seek and were in no mood to disappoint the city. A way of joy swept the ETT teachers after the state Cabinet gave its nod to the merger of elementary schools under the Zila Parishad and panchayats with the state Education Department. A Bathinda-based non-resident Indian (NRI), Dr Jagvinder Singh Virk, who is the chairman of the India-Australia Strategic Alliance (IASA), has been selected as the youngest and first Vice-Chancellor of King's International University, Tonga, an island the pacific, while Dr Bernard Malik of the USA is the first Chancellor of the university. Following the tussle between the school management committee and the principal of Guru Nanak Dev Public Secondary School, Kamla Nehru Colony, a meeting was conducted by the committee at the school today. The meeting was attended by parents of some of the students of the school and some of the former teachers. About 48 hours have passed but the police have not been able to trace the missing school boy. 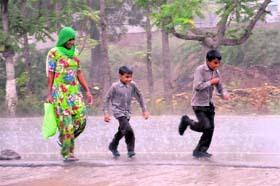 The much-awaited rain brought smiles on faces of farmers. Almost the entire region received rainfall today. Various parts of the region received light to moderate rain this morning. Due to the prolonged dry spell, drought-like situation was prevailing in the region. However, today’s rain has given some hope to the farmers. Students of BSc in Airlines Tourism and Hospitality Management (fourth semester) at Baba Farid College passed the university exams with flying colours. Harsimranpal Singh topped the college with 79.14 per cent marks followed by Tripta Rani and Ruprinder Kaur, who secured 78.5 per cent and 78 per cent marks, respectively. 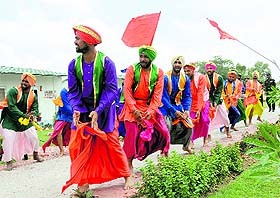 Celebrating adventure: Armymen perform bhangra during the flagging of a trekking expedition in Bathinda on Wednesday. Tribune photo: Pawan Sharma. Baba Farid College organised a talent hunt programme here on Tuesday. The purpose of organising the event was to find out talented students and train them for participation in the zonal youth festival to be held later this month. In the beginning of the programme, literary events were conducted. The students showed their caliber in debate, elocution and poetry recitation. Students of Guru Gobind Singh College of Education, Talwandi Sabo, a constituent college of Guru Kashi University (GKU), visited Mahant Gurbanta Dass School for Deaf and Dumb. Dr NS Malhi, Vice-Chancellor of GKU, flagged off the two buses for the visit. 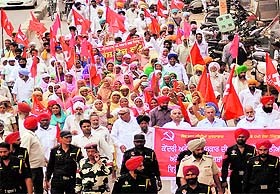 Activists of the CPI, CPM, CPI (ML) Liberation and the CPM Punjab (Pasla) staged a protest against the Centre and the state government at Amrik Singh Road here today. They protested against the Prevention of Damage to Public and Private Property Act, 2014. A trekking expedition team was flagged off from Bathinda Cantonment by Lt Gen Ravi Thodge, AVSM, SM, VSM, General Officer Commanding, 1 Corps, as a part of their golden jubilee celebrations. the Sarvashreshth Engineer Bridge Regiment is undertaking a trekking expedition from Palampur to Manali. 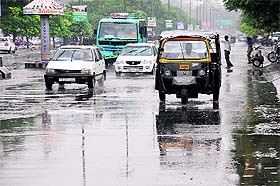 The weather changed for better after noon and the city received drizzle at around 1 pm. Overcast conditions prevailed at 3 pm and it began raining, soon after, brining down the mercury by a few notches. While the Met Department will measure the amount of rain the city received on Thursday morning, it issued a forecast stating that the city was poised to receive more rainfall on Thursday as well. As per the Agri-Met Department of the PAU regional centre in Bathinda, while the minimum temperature on Wednesday was recorded at 25.6 degree Celsius, the maximum temperature was recorded at 30.4 degree Celsius. As per the forecast released by the Indian Meteorological Department (IMD) for the district, there is a possibility that Bathinda and its adjoining areas may experience thunderstorm followed by rain over the next four days. The forecast also added that the minimum temperature would hover around 23 degree Celsius and the maximum temperature would fall further to 29 degree Celsius. The Met Department also added that the upper reaches of Himachal Pradesh received the first snowfall of the season, which might have brought the change in weather. Manali, Lahaul-Spiti, Pangi, Kinnaur Pir Panjal range, Kugti, Baralacha and Deo Tibba received snow only a few days ago. While the commuters didn’t mind getting caught unaware in the rain, residents of several areas of the city faced the old problem of waterlogging once again on Wednesday evening even though it hadn’t rained incessantly. Narrow alleys of the areas like Balla Ram Nagar, Civil Lines, Amrik Singh Road, North Estate, Dhobiana Road, Sirki Bazar, Mall Road, Shant Nagar, Parasram Magar, Ganesha Basti, Bhai Mati Das Nagar, Mansa ROB among others experienced waterlogging. For the past eight years, the ETT teachers had been protesting against the state government’s decision to shift the elementary schools from under the Education Department to the Zila Parishads. Bathinda district president of the ETT Adhyapak Union, Gurjeet Singh Jassi, expressed gratitude towards the state government for heeding to their demand, albeit after many years. He also thanked ETT teachers Jaswinder Singh Sidhu, Vipin Lota, Lakhvir singh and Paramjeet Singh for observing an indefinite fast for 41, 30, 28 and 17 days, respectively, and forcing the state government to give in to the demand of the teachers. He also thanked all the other ETT teachers for following the announcements made by the union heads across the state. Terming the entire state a battlefield, he called the nod as a victory of not only the teachers but thousands of children who are studying in these schools. He also expressed his gratitude towards members of all teachers’ unions, farmers and other unions who stood by the ETT teachers. Jagmail Singh, Arjan Singh Dhillon, Avtar Dass, Raj Kumar Verma, Rajinder Raju, Kuldeep Bhagta, Nirpinder, Nachchatar Virk, Balvir commando, Jaswinder Mehtamanjinder Maur, Jagjeet Singh and others were also present on the occasion. Dr Virk, who was hugged by the Australian Prime Minister Tony Abott after the latter's victory speech on September 7, 2013, has been an active member of the Indian community in Australia. He has been honoured by different communities and was also honoured with the Community Service Award (CSA) by the Australia Mission of SAI (AUMSAI) in October 2013, and another CSA in November 2013 by the chairman and the founder of the Nanaksar Trust. Besides, he also received the certificate of appreciation for outstanding community service in Victoria from Elizabeth Miller, State Member for Bentleigh. Dr Virk was also honoured with the Sher-e-Punjab Award by the Sikh Welfare Council of Victoria in March this year. With an aim to transfer technology and promote education, research and development, Dr Virk said, "Our focus is on providing good courses both online and at our campuses in India. I have been given a big responsibility for which I am thankful to the government of Tonga." Last year, Dr Virk was chosen by the NSI department of University of New South Wales (UNSW) to monitor the commercialisation of its technologies in India and other subcontinent countries. Being a member of the Australian Liberal Party with his "Tea Party Campaign" at the grassroot level with Indians and other ethnic groups in Australia, Dr Jagvinder Virk, was appointed as the head of India and subcontinent countries by the Industry Engagement Committee of the UNSW. The IASA has transferred defence technology to India besides launching a project to make silicon carbon tiles (bullet-proof jackets) to save the lives of Indian soldiers. A factory to manufacture these jackets was inaugurated in Bahadurgarh district of Haryana on August 3 this year. "King's International University is deemed to be one of the greatest institutions of higher learning and the plans are in place to go global by the end of 2015. The university will offer a number of scholarships to the deserving students," added Dr Virk. During the meeting, the parents requested the committee to reinstate the ousted teacher, Veerpal Kaur. It is pertinent to mention here that the services of Veerpal Kaur were terminated on Tuesday, along with the principal of the school, Sarabjeet Kaur Sra, by the management committee. The parents also requested the committee to mull over maintaining the sanitation situation in the school. They also urged the committee to install an RO system on the school premises to make sure that the students get potable water. The parents also asked the officiating principal to install a complaint box in the school to make it easy for the teachers and students to register their complaints. and reinstatement of Veerpal Kaur. The parents also pointed out that the new school committee’s decision to recruit new teachers for the school in the middle of the academic session was not a favourable idea since teachers should not be changed in the mid of the session. The parents requested the committee to make sure that the new teachers started taking classes in the next academic session. The parents also pointed out that it was unethical for the school staff to involve the students in any protest. They accused the committee and the teachers of being oblivious of the fact that the tussle between the teachers and the committee was affecting the studies of the students and jeopardising their career. 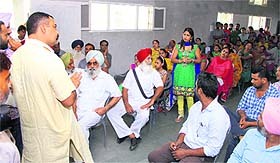 Former teachers of the school, who were also a part of the meeting, levelled allegation of harassment against the terminated principal of the school, Sarabjeet Kaur Sra, and said that they were left with no option but to leave the school since they were subjected to mental harassment by the principal. Former mathematics teacher of the school, Sumati Brar, alleged that since she was forced to teach every class and it impacted her health. She added that when she asked the principal for leave, the principal turned down her plea and she was forced to resign. In the initial investigation, the police reached the conclusion that Harshit had run away from home due to the pressure of studies. He had also told his friends that he was planning to run away from home and had written in his copy about the plan. He used to tell that he would run away to Delhi or Mumbai. While his family is in a state of shock, his mother has not stopped crying for the last two days. Harshit Grover (14) left home around 2 pm for his tuition and went missing on Monday. The Kotwali police recovered his bicycle near the parcel house of the railway station. The police have started searching for him on the complaint of his father Manoj Grover. The police also visited the school and have questioned the students and the teachers. Sources said Harshit was not serious towards his studies. In his copy, he had written a plan to go to Delhi or Mumbai. Principal Satwant Kaur Bhullar said Harshit was depressed for the past a few days and had not come to school for four days. The SHO, Kotwali police station, Mahesh Saini, said during the parent-teacher meeting on Monday, his mother had scolded him, which could be the reason behind it. He also stated that the police are using social networking sites to find him and special teams have been formed for the investigation. Amardeep Singh, a farmer, said due to weak monsoon the input cost had escalated as they were forced to to use generators and more fertilizers to save their crop. Another farmer, Jagsir Singh, said the rain had come as a boon. Agriculture Department officials said rainfall would revive paddy crop in some parts of the region . Farmers had re-ploughed fields at in various areas because of the drought-like situation created by weak monsoon. Despite reports of light to moderate showers in the region, weak monsoon has already taken a toll on the kharif crops. Notably, the farmers has been accusing the government of failing to provide eight-hour power supply. Rice and other kharif crops need 120 days to mature and a lot of water. The most suitable period for the sowing of cotton is from June 15 to July 15. This was followed by theatre performances by the students. Giddha and bhangra were also performed by them. The best teams will participate in the zonal youth festival. Under the fine arts category, rangoli, poster-making, on-the-spot painting, collage-making and clay-modelling events were conducted. A few students turned up during trials for of classical dance. The deputy director, academics, BFGI, encouraged the students to do well in extra-curricular activities. During the visit, the BEd students were told about the challenges faced by physically-challenged students. The students of the school have been frequently visiting GKU for the past a few years on various cultural and sports events. Satwinder Kaur, chairman of the tour committee of the college, said more such visits would be organised for the overall development of the student. Terming the Act as a “black law”, the protesters raised slogans against the state government, demanding its immediate withdrawal. They also protested against the government’s alleged anti-people policies. Addressing the rally, Left leaders said by passing such a law, the SAD-BJP government had curbed the right to protest. “Now, the state government can send any person to the jail by registering a false case,” they said. They condemned the alleged anti-people policies of the Punjab Government, which, according to them, have resulted in price rise and unemployment. “The mafia aided and abetted by the government is controlling the transport sector, cable TV, sand and gravel in the state. The leaders of the ruling coalition are grabbing public land,” they said. They said that they would not tolerate the “anti-people” Act at any cost and vowed to launch a massive agitation if the government failed to withdraw the Act. They also demanded a minimum of Rs 3,000 as the old-age and widow pension, Rs 15,000 as wages for unskilled workers, implementation of the Swaminathan panel recommendations, unemployment allowance, removal of toll plazas, cheap education and health services for the common people. They also expressed concern over crime against women and the Dalits in the state. Notably, they had held a protest march against in the city over their demands. The expedition will cover a total distance of 168 km from Bir to Manali in 16 days. 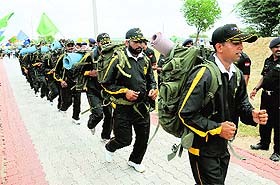 The 12-member Army team will cross two passes—Thamsar (4,665 m) and Kalihani (4,725 m) during the expedition, which is being led by Captain Prashant Chaudhari. The General Officer said the expedition undertaken by the regiment indicated the physical fitness, mental robustness of the soldiers.